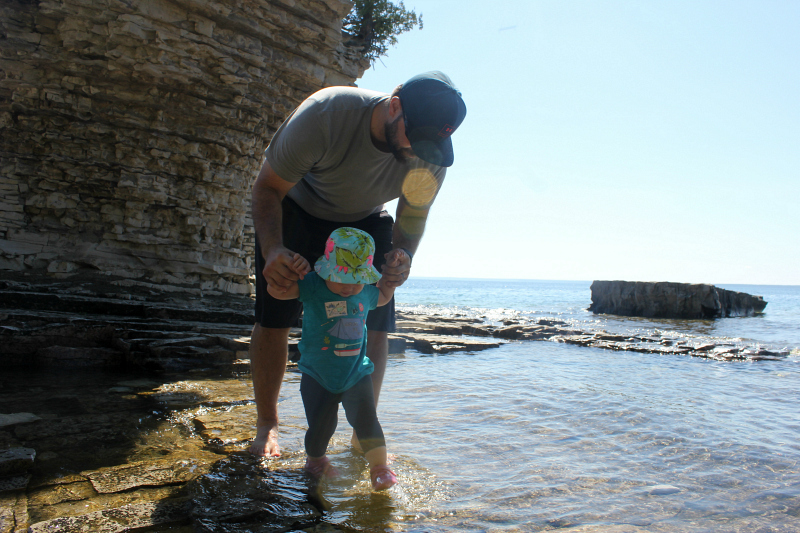 On a recent trip up to the family cottage on the Bruce Peninsula, we planned a day adventure to Flowerpot Island. 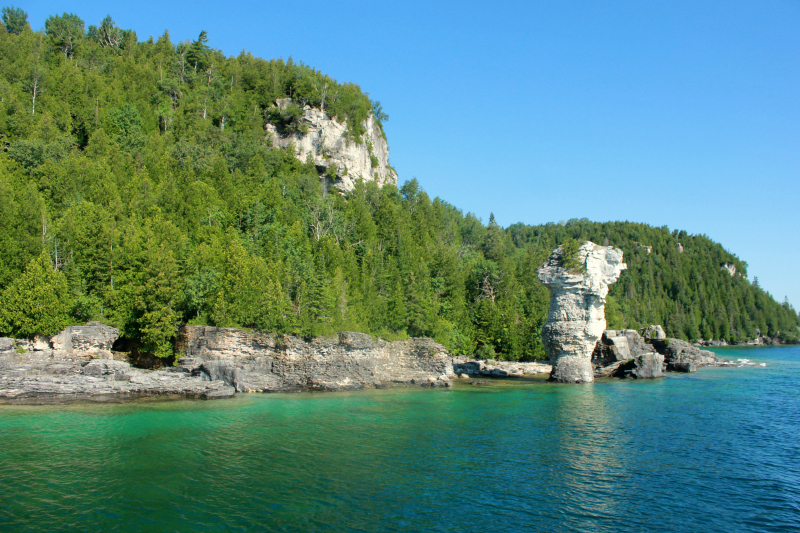 One of the best, and most popular, experiences in Parks Canada’s Fathom Five Marine Park, Flowerpot Island is also one of Canada’s most fascinating natural attractions. 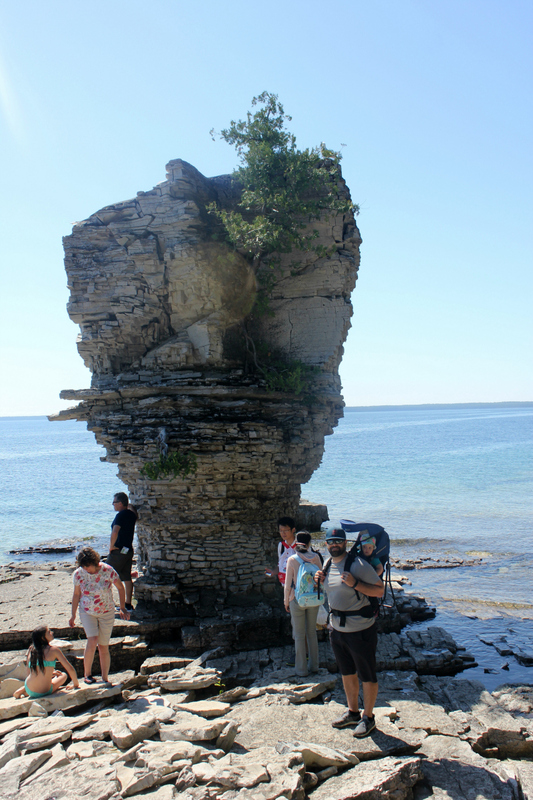 Read more about our recent Flowerpot Island adventure, here. Whether you’re into camping, swimming or hiking, the Island has just about something for every weekend adventurer. But, before you plan a trip over, there are some things to know. 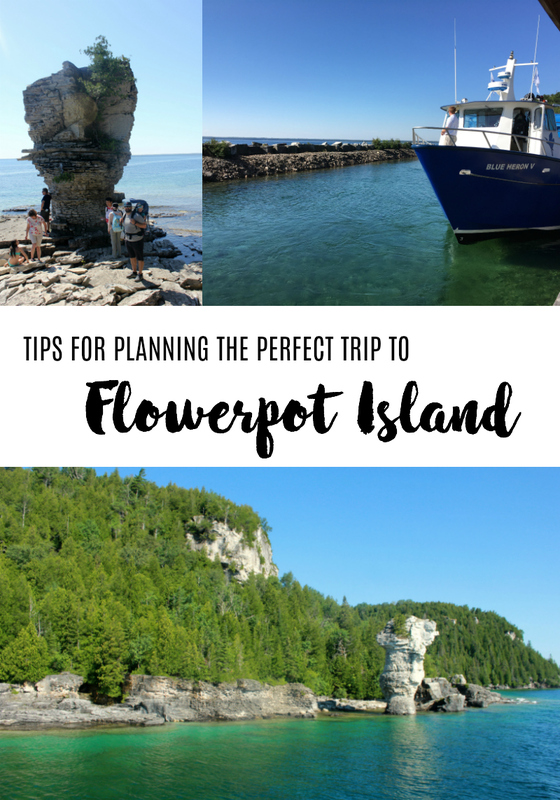 Here are some tips on how you can make the most of your visit to Flowerpot Island. Flowerpot Island is located in Georgian Bay, 6.5km from Tobermory, and reached only by boat. Two private tour boat companies operate return trips from Little Tub Harbour to the Island from mid-May to mid-October (weather permitting) - The Blue Heron Company and Bruce Anchor Cruises. Experienced paddlers can also kayak or canoe over to the island. What operator should I chose? 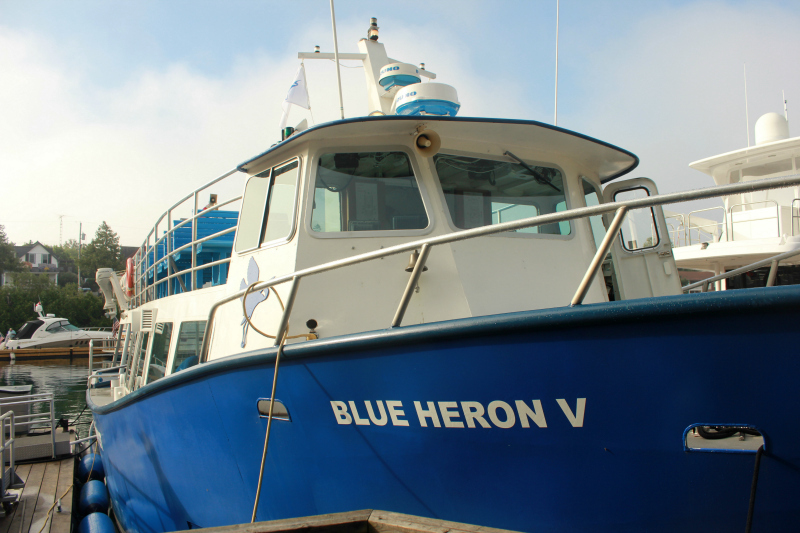 The Blue Heron Company is one of two companies that offers private sightseeing tours to and from Flowerpot Island. It is the company we have always used as a family, which is the reason we chose it for our recent trip. I cannot comment on the pricing, boats, service, etc. of the Bruce Anchorage Cruises. The Blue Heron Co has several cruise options to chose from, including a non-stop, express and sunset cruise, and several cruises departing Tobermory every day they are operating. We opted for the glass bottom cruise, which includes shipwreck sightseeing, whereas the cruise back to Tobermory is direct. Both companies operate out of Little Tub Harbour in Tobermory. 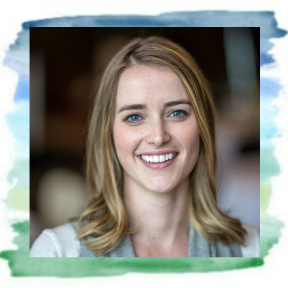 Tickets are available for purchase at the dock, or online in advance. We recommend purchasing tickets in advance, as cruises will fill. Tickets are purchased as a round trip, and departing and returning times must be selected at the time of purchase. Prices vary per cruise company, cruise type and time of year. Check the website for more details. 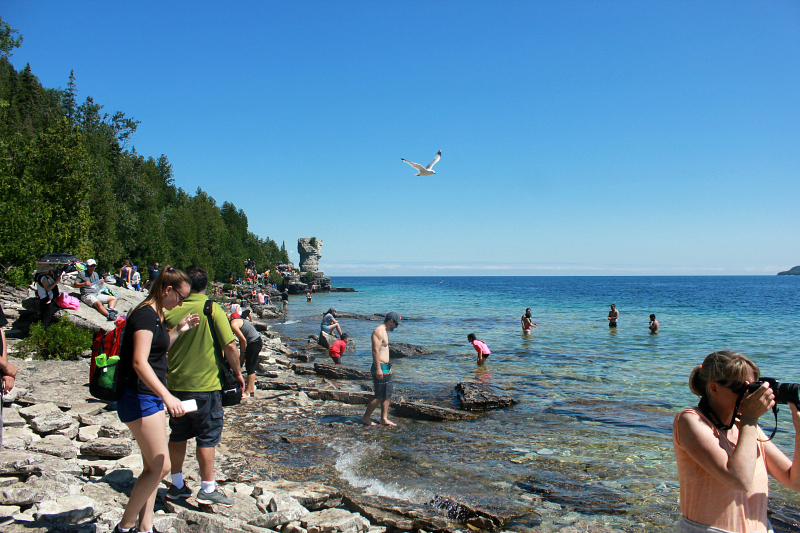 Please note, every person stopping on Flowerpot Island is subject to National Park entry fees (*waived with the Discover Pass in 2017). This fee is included in your ticket cost, and is remitted to Fathom Five National Marine Park and help to cover the upkeep costs of the island. Lately they have been used to build a rain/sun shelter on the dock where you will load/unloaded, to improve the trail system all the way to light station, and to build new washrooms facilities. What is a glass bottom boat? Don’t let the name fool yet, the entire bottom of the boat is not made from glass. There is a large section of the bottom of the boat that is glass, however, the shipwrecks are also easily viewed over the sides of the boats as the water is very clean and clear. The Island can get very very busy! (Don't believe me? Check out the photo below, taken around noon.) We recommend booking the first boat out in the morning (in our case, 9:00am) and returning in early afternoon (in our case, 12:50pm). This gave us approximately 2 1/2 hours on the island, which was plenty of time to view the formations, visit the light station, hike the loop trail, have a snack and dip our toes in the water. As we left, the boats coming in were very full. Leaving at 12:50pm also allowed us to escape the afternoon heat. I’m traveling with my children. Are strollers allowed? If travelling with small children, leave the stroller at home! The trails on the island are not suitable for a stroller, and it will be more a hassle than its’ worth. Instead, opt for a child carrier. We love MEC’s Happytrails Child Carrier (review to come). Are there garbage facilities on the Island? Remember, this is a National Park. Please leave no trace – pack out what you bring with you. What goes in, must go out. There are no garbage or recycling facilities on the Island, so visitors must take home all of their trash. Parks Canada was on hand at the dock, providing those arriving with biodegradable bags for waste. Is there drinking water available on the Island? There are no drinking water stations on the Island. Ensure you bring enough water to last your entire visit, as it can get very hot! Additional questions about a trip to Flowerpot Island, or another experience in or around Tobermory? Please ask! I’d be happy to help!